(MP133). Watercolour signed R A de S Cosby and dated 07. Standard size: 20.5 x 10.24 ins (51 x 26 cms) approx. Wearing the flag of Rear Admiral Commanding Battle Cruiser Squadron, Rear Admiral C T M Fuller CB CMG DSO, HMS HOOD (Captain H O Reinold CVO RN) was based at HM Naval Base, Portland, Dorset for 3 weeks in the autumn of 1926. The other two ships of the 1st BCS were there too: HMS REPULSE (Captain E R G R Evans CB DSO RN) and HMS RENOWN (Captain N A Sulivan RN). 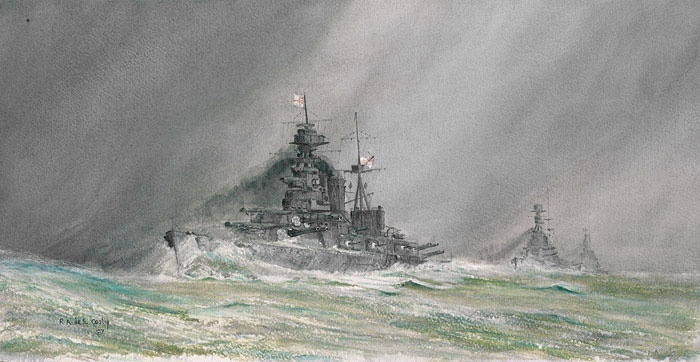 All three battle cruisers participated in the big tactical exercises held south of Portand Bill on 30 October staged for the benefit of high ranking delegates from the Imperial Conference who were visiting London from the dominions and had a day at sea with the Royal. These three big and internationally well known ships with their impressive appearance, spacious upperdecks and well appointed senior officers quarters would have made ideal platforms from which the delegates could have viewed the exercises and there are many photographs of the occasion depicting the three battle cruisers showing off in the big seas - turning at speed, thundering past the delegates in line ahead, bows high and wreathed in green water and spray, sterns tucked down and kicking up monstrous wakes, rolls of oily smoke being torn by the gale from funnels as additional sprayers were lit to get those extra few knots.... How many of those VIPs were actually still on the upper deck to watch the spectacle laid on for them is another matter as by all accounts the weather was indeed bad: Force 9-10 winds with huge seas running - not untypical Portland winter weather as those of us who have worked up ships there in the past know well!